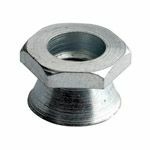 Shear Nuts are a Break-Away type of security nut, that provide a permanent fastening that is very hard to remove again once installed. 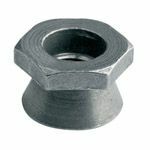 These tamper proof nuts are among the most popular security nuts available and are available in a range of materials to suit indoor or outdoor applications. They are installed with a conventional ring or box spanner or a suitable socket drive. 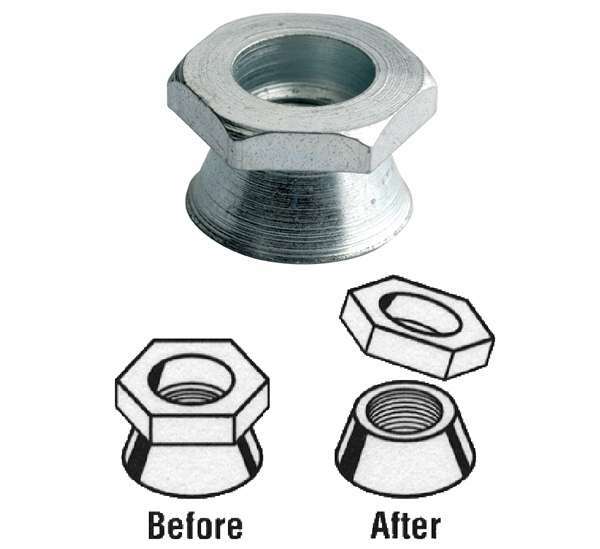 The shear nut is a "one-way" security nut, that is designed to provide a permanent fixing which once done up, can't easily be undone again. Shear Nuts feature a threaded conical section, topped by a hexagonal drive head. The nut is installed using a conventional spanner of the appropriate size. Once the nut is fully tightened and maximum torque is achieved, the hexagonal drive head shears off leaving the operational conical section of the shearnut permanently in place to anchor whatever it is securing. This is the reason that the Shear Nut is sometimes referred to as a Breakaway Nut or Break Off Nut. Shearnuts deliver a simple, low cost solution for any project where a permanent fixing is required. For example, they are used to anchor park benches to pre-embedded fixing studs, or for securing street signage, etc., ...providing an effective deterrent against theft or vandalism. The A4 (Marine Grade) Stainless Steel version of the Shear Nut is ideal for use in particularly hostile environments such as coastal locations, or for other marine applications such as on-board boats or ships. 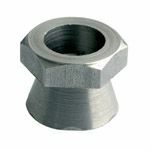 Shear-nuts are available from stock in a range of metric sizes and a choice of materials. Stock sizes include; M6, M8, M10, M12, M16 and M20 (larger sizes can be manufactured to order), while materials include BZP steel, galvanised steel and Stainless Steel (A2 and A4 grades). These one way nuts are installed using a conventional spanner (not supplied), so you won't need any special Security Driver Type Tools.